When the temperature drops and summer transforms into fall, nothing tastes better than a hot bowl of chili. Whether you just want to enjoy a piping hot bowl of chili in the comfort of your own home, or you plan on hauling a batch in the slow cooker to your Saturday morning tailgate, chili is a fall-favorite recipe that won’t go away anytime soon. One thing that makes chili such a crowd favorite is its versatility. The classic, loaded Texas chili has been replaced by dozens of variations, including vegetarian chili, paleo no-bean chili, Whole-30-friendly chili, white chili, or chicken chili. Below, you’re going to add one more version to the list: white turkey chili. If you look at the nutrition facts below, you’ll see this healthy recipe contains just 5.5 grams of net carbs per serving, and is low carb, gluten free, and completely keto friendly. What’s the Difference Between White Chili and Red Chili? “White” chili gets its name from it’s appearance. Unlike red chili, which combines diced tomatoes, tomato sauce, ground beef, kidney beans, cayenne pepper, and chili powder, traditional white turkey chili typically simmers ground turkey, white kidney beans, green chilies, celery, and corn in broth. You also find many white chili recipes using some sort of shredded meat, such as shredded chicken or turkey. To add a layer of creaminess to white chili, many recipes combine dairy with the broth, whisking in heavy whipping cream or heavy cream. To add a bit of spice, you might toss in a few diced jalapeños or green chilies. Finally, topping with shredded cheddar cheese or tortilla chips adds a little crunch. 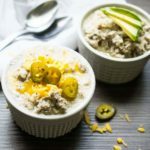 How Do You Make Low Carb White Turkey Chili? Most white chili recipes call for several types of beans and corn — which makes for a tasty, but not the most low carb, concoction. To make your delicious bowl of chili low carb, there are a few swaps you need to make. To make this healthy chili recipe, you’ll first have to eliminate all legumes, including white beans, kidney beans, and black beans. While it might seem unorthodox to make a beanless chili, trust that there are still a breadth of flavors you can pour into this one dish. Secondly, you’ll need to remove any grains. Many chili recipes are poured over quinoa or rice (particularly vegetarian chili), which add a filling agent to the recipe. If your family tradition is to serve chili with rice, there is one small keto-friendly swap you can make. Rather than pour over white rice (which contains an incredible 45 grams of carbohydrates per cup), this healthy turkey chili calls for cauliflower rice[*]. Cauliflower rice is simply cauliflower shredded into rice-like strands, with a fraction of the carbohydrates. While you might top your favorite chili with tortilla chips or other high-carb options, you’ll use keto-friendly toppings in this turkey chili recipe. Consider topping your chilli with avocados, diced bell peppers, shredded cheese, plain, Greek yogurt, bacon, or sour cream. Why Should You Use Coconut Milk Instead of Heavy Cream? To answer any lingering questions, yes, dairy is permitted on the keto diet. That being said, dairy products should be chosen only if they’re of the highest quality (grass-fed and organic whenever possible). In addition, while dairy does contain protein and healthy fats, it still contains sugar (lactose), making certain foods, particularly milk, half and half, and condensed milk, ill-suited for a low carb diet. Dairy is fine in moderation, but a much better alternative is to choose a dairy-free alternative. In many recipes, including the recipe listed below, this means substituting coconut milk or coconut cream for milk or heavy cream. Will Coconut Milk Make the Recipe Taste Like Coconut? In most cases, no. Think of your favorite Thai curry dish: It’s rich, thick, and creamy, yet you can’t taste the coconut. The same holds true for many recipes, including this white chili. If the recipe contains enough seasoning and other ingredients to cut the taste of coconut, you will rarely taste it. This is particularly true when a recipe contains red pepper flakes, black pepper, sea salt, or garlic, which seem to be incredibly efficient at eliminating the almost sweet taste of coconut. If you make the dish below and you still taste a hint of coconut, try slowly adding chicken broth to your mixture. Why Is Coconut Consumption So Helpful on Keto? Not only can coconut milk add an element of creaminess to soups and stews, it adds many nutrients you wouldn’t otherwise ingest. Coconut milk is a powerhouse of nutrients, praised for its health benefits. Ninety-three percent of the content of coconut milk comes from fat, most of which comes from a certain type of saturated fatty acids called medium-chain triglycerides (MCTs). Those following the keto diet refer to MCTs as an ideal energy source, but what makes these fatty acids so special? Unlike many fatty acids, MCTs do not need enzymes to be broken down during digestion. Instead, they are transported directly to the liver where they can immediately be used for energy. This raises your ketone levels and causes minimal fat storage in your body. MCTs have also been shown to boost mental clarity, speed up your metabolism, strengthen your heart, and improve your digestion[*][*][*]. This white turkey chili is the perfect healthy recipe to work into your weekly meal prep. It takes just five minutes to prep and a total cook time of just 15 minutes, ready to eat in 20 minutes. If you’re a busy parent or a working professional, consider preparing your chili in an Instant Pot or slow cooker to follow the “set it and forget it,” cooking method. Otherwise, you can prepare it in a Dutch oven or large pot over medium heat on the stovetop. With nearly 30 grams of protein and less than 6 grams of carbohydrates per serving size, this chili recipe will help you keep your carb count low and your meal plan exciting. For other new recipe ideas, check out the dinner recipe section on this site. This crazy easy white turkey chili has saved me $1000’s in therapy sessions I would have needed to work through my glaring “dry white turkey meat” issues. In a large pot, heat the coconut oil. In the meantime mince the onion and garlic. Add it to the hot oil. Stir for 2-3 minutes then add in the ground turkey. Break up with the spatula and stir constantly until crumbled. Add in the seasoning mix and riced cauliflower and stir well. Once the meat is browned add in the coconut milk, bring to a simmer and reduce for 5-8 minutes, stirring often. At this point it’s ready to serve. Or you can let it reduce by half until thick and serve as a dip. Mix in shredded cheese for an extra thick sauce. Hi. Thanks for the recipe. It looks delicious. Can you help me understand the nutrients? How many calories per serving? How many net carbs per serving? It says that there are 388 calories from fat. Presumably there are other calories as well. Is the data there for the entire recipe or for one of the 5 servings? Hi Amy, there are 388 calories per serving and this recipe makes 5 total servings. There are about 2g net carbs per serving with 5.5g total carbs. I am assuming when you use heavy cream the calories for this is not the same as coconut milk? I used heavy cream, entered this recipe into MyFitnessPal, and it’s telling me 1206 calories per serving. Does that sound correct? It’s amazing by the way, but a lot of calories using heavy cream. Hi Amie, 2 cups of full fat coconut milk has about 960 calories whereas 2 cups of heavy cream has about 1,640 calories so yes the calories will be more when using heavy cream. Hello, I just started Keto 3 days ago, so please forgive me if the question seems like I don’t know what I’m talking about, which I don’t! Is it possible to use regular ground meat? Why use the turkey since we are trying to eat lots of fat. Thanks for your response. Hi! Yes, you can totally use regular ground meat! This is just one recipe out of many for some people who may prefer turkey over red meat. But you are totally right and can definitely use red meat! Where does the mustard come in? I don’t see instructions for that in the recipe. Hi Kitti, 1/5 of the entire batch would be 1 serving. I is kind of hard to eye ball 1/5 of the batch. Is there a measurement, like 1 cup, that I can use? is that 1 tsp of each or do you mean in total only 1tsp of the combined? Hello Sophie. Yes 1 tsp of each. Just made this recipe and forgot to add the mustard and it’s still delicious!! So easy and filling!! I made the recipe and added turmeric, cardamom and Thai basil. I used basil mustard and served over zucchini noodles. Delicious. This is a good base to use w/a variety of spices. I’d use cream instead of coconut milk if you are shooting for an Italian or Mexican flair. I’ll make it again and try it with Italian spices and serve over spaghetti squash. My husband and I had this for the 1st time. Yummmy! I added cumin and fresh celery. It’s a keeper! This sounds amazing, can’t wait to make it, thank you so much!